Preheat oven to 350º F. Prepare four 9-inch round cake pans with a lining of parchment paper, and nonstick baking spray. Beat the butter until light and fluffy with an electric mixer. Slowly add sugar one cup at a time, making sure to fully incorporate each cup before adding another. Add eggs one at a time, making sure to fully incorporate each egg before adding another. Whisk together flour, baking powder, and salt. Pour the buttermilk and vanilla into measuring cup and whisk together with a fork. Add to the butter mixture, and alternate with the milk mixture, beginning and ending with dry ingredients. Gently stir all ingredients until well combined. Stop mixer and scrape down sides of bowl, making sure that all ingredients have fully mixed. Gently fold in the sprinkles, until they have been evenly distributed throughout the batter. Pour equal amounts of cake batter into each cake pan, and place pans into oven. Bake for 25-30 minutes, or until a toothpick inserted in the center comes out clean. Remove and allow to cool slightly in cake pans for about 5 minutes, then cool completely on a wire rack. Qué tarta tan delisiosa!!!!!!! se nos hace la boca agua, y el relleno de la crema de mantequilla de almendras es perfecto. Besos de tus amigos Recetasbonappetit. Thanks!! I was really happy with how it turned out ? It seems it’s funfetti cake time!!! I love it 😉 Thanks for visiting! This is probably one of the prettiest birthday cakes ever! I had a quick question! In the cake batter instructions you say to cream together butter and shortening but the recipe only calls for butter. Should it be half butter half shortening? I’m trying out this cake for my friends birthday and just want to make sure I do it correctly the first try! So sorry! I tweaked the recipe a while back to remove the shortening (it tastes better with all buter :P), but didn’t update the instructions! So sorry for any confusion!! I just fixed it 🙂 Thanks!! The cake was great! My buttercream was stiff, hard to spread and didn’t yield as much as I would have thought. I’m not sure what may have happened but I’ll definitely give it another try. Regardless the cake itself was terrific and a keeper recipe! hmmm, Maybe your butter wasn’t the right temperature?? How would I half this, I only want to make 2 layers. You can definitely half the recipe! Do you have to use buttermilk or can you just use normal milk? the buttermilk gives the cake a bit more flavor / tang, but if you don’t have any you can also use regular milk! Would you recommend 2 or 3 eggs when halving? It really just depends on the recipe! my cake recipe is a butter cake recipe, and is slightly more dense than a sponge cake! As long as you use the type called for by a particular recipe you should be fine! Do you use unsalted, or salted butter for cake and frosting? Thanks ? I always use unsalted butter in my recipes for both frosting and cake! Where does the almond extract come in to play? Thanks!! just updated! It’s added into the buttercream once it’s mixed! Yes! I’ve used it to make sheet cakes before! it caramelize quite a bit though, so I’d recommend lowering the oven temp by 25 degrees, and placeing a flower nail in the center of the pan to help it bake more evenly! can you turn this recipe into cupcakes? Hi Chelsey! I love watching your livestreams and finally made it over to your site 🙂 My fiancé comes home from deployment soon and LOVES funfetti. I thought I’d try my hand on a welcome home cake for him using this recipe! I don’t have a stand mixer. Would this work just as well with a hand mixer? Thanks in advance! Hi Chelsey! 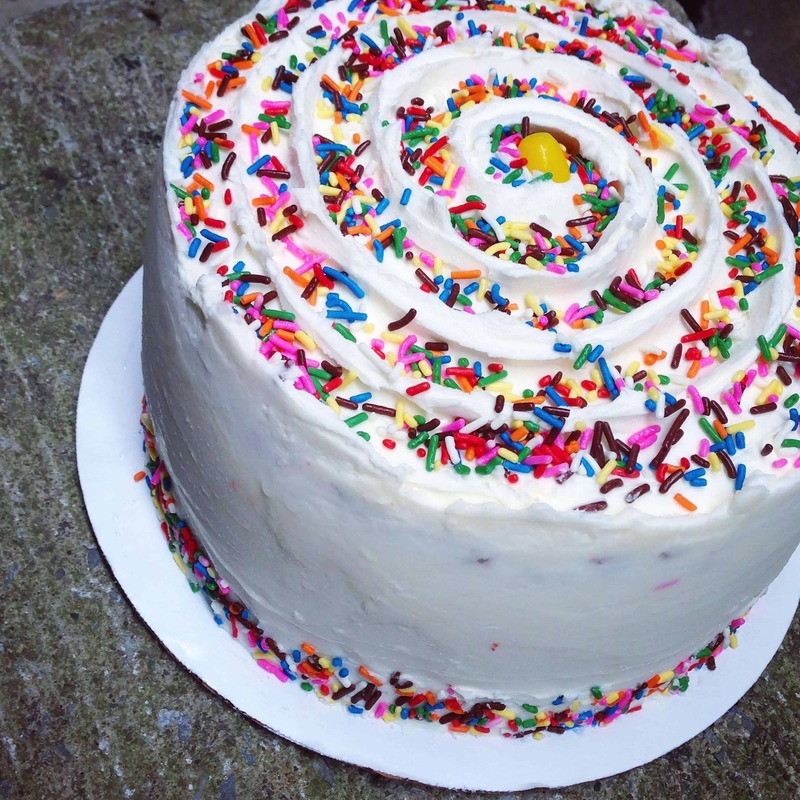 Love following all your tutorials I remember you mentioned somewhere where you buy/what brand of sprinkles you prefer. Could you remind me what sprinkles you like to use again? 😀 Thank you so much! What is the difference in this cake recipe and your regular vanilla cake recipe? The ingredient measurements are different and the eggs are too (whites vs whole eggs) so I’m wondering why? This recipe is a bit lighter and fluffier than my classic vanilla layer cake recipe! I used this recipe last weekend and it was as delicious as your vanilla recipe. Now I don’t know which I like better. Have you tried this with whole-wheat pastry flour? Had any luck? I’ve got a 12″ springform pan. Would this recipe work for 2 layers in that size? I haven’t tried out any other flour besides all-purpose with this recipe. one batch of cake batter barely makes three nine inch cake layers, so I think it would barely make one 12 inch cake layer!